beautiful for my little granddaughter's room. Stylish and comfortable, the Urban Habitat Jojo 7-piece Comforter Set is the perfect update for your bedroom. The 100-percent cotton comforter showcases a pieced design in ivory, grey, and blush hues accented by jacquard tufted dots. Matching shams coordinate beautifully with the top of the comforter, while quilted euro shams add extra dimension to the bedspread. A solid blush reverse provides additional color to the comforter set, while two decorative pillows, featuring fabric manipulation and embroidered details, complete the bedding ensemble. Absolutely beautiful comforter! Colors are just right. Soft and fluffy. Highly recommend. I also like that this comforter comes with so many extras. Two grey shams, two standard size pillowcases that match the comforter, a small pink pillow and a polka dot pillow. I absolutely love this set! I ordered a lucid mattress recently and ordered this to go with it... together they are like sleep beyond description. So warm and still breathable superior comfort! Perfect for a little girl’s bedroom. The material is definitely well made and durable. This comforter set is not just any cheap bed in a bag set. Decor is easy to match with the light pinks and grays. Very happy with the quality and overall look of this set. Nice set. It runs short, so I would order a size up if you want a long drape. The 2 accent pillows are both very nice, better quality than most. A little pricey for what you get, but very pleased overall. Love the fabric and color combination on this comforter set. The decorative pillows are really lovely! My young teenage daughter picked this out--we use her room as a guest room and looks great for guests too! I bought this comforter for my teenage daughter she saw online and really wanted. We are redoing her room and designed around it. I am so glad we purchased and what a great buy! It's not cheap, it's very well put together. It's super sleek and rustic sheek. 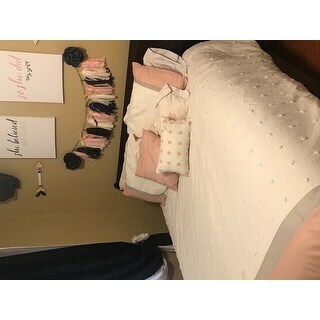 I would definitely recommend this comforter, we are extremely happy with. This is a very pretty set. The comforter is more for show, as it's not that soft and it's not that thick. However, the quality is still amazing for the price. If you put a plain comforter underneath it looks just like the photo. Beautiful set, beautiful colors! Comforter size is great, not short on the sides. I also got the mint green color of this set, it is just perfect for girls rooms. Nice quality. Just wish there was a bedskirt. I have gotten alot of compliments.. This is a beautiful comforter set. Very well made. Great quality and the price was awesome. I am returning it however because it is not pink it is peach which doesn’t go well with my grey and pink walls. It is exactly as pictured and I am completely satisfied. Good quality. I purchased this comforter set for my guest bedroom because I anticipate my mother staying with us as my father recovers from a fall on the ice. It will really brighten up the room and make it more like “home” for her. Adorable! Love it! So many pillows! It’s excellent quality and compared to every other site it’s the cheapest by far! "Is this offered in a mint green color as mentioned in a review comment?" "What color is the reversible side of comforter, please?" It is a light peach color. "when will full / queen be available?"